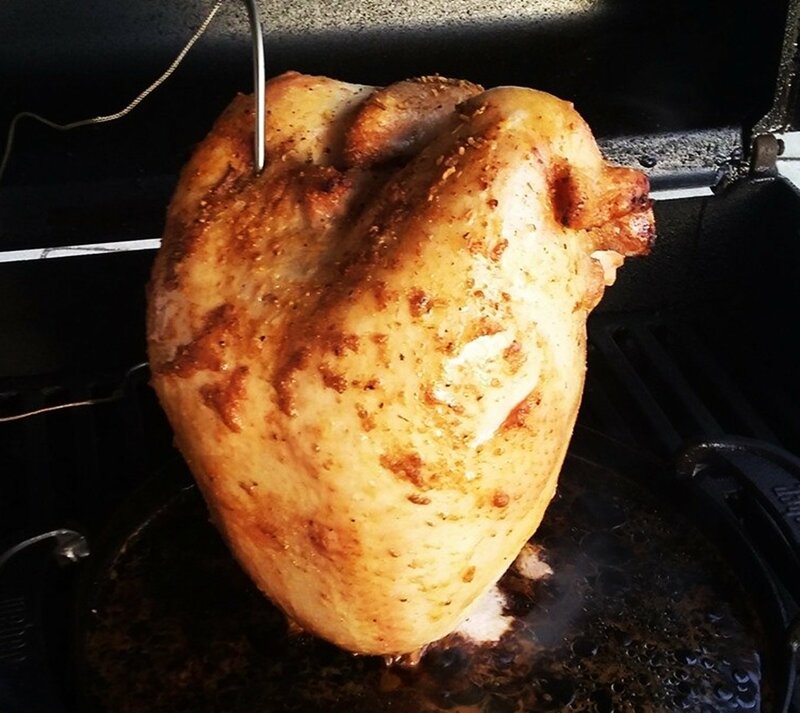 For thanksgiving this year we decided to grill a whole turkey breast beer can style. We have a small family so we can get away with just grilling the breast. The family is also particular about a traditional tasting roast turkey. So, I assured them that I could pull that off on our gas grill without a problem. 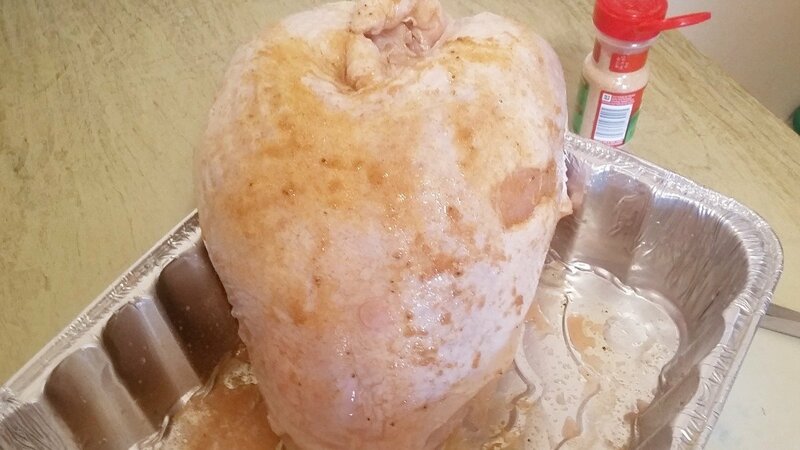 We started with a Honeysuckle brand frozen young turkey breast that was almost 8.5 pounds (cost $14.98). We thawed the turkey breast in the fridge for 3 days before Thanksgiving. Always check the cavity first. Looking for any left over ice. The morning of we injected and seasoned it. We did all the prep in a high sided disposable aluminum pan. I took 6 ounces of oil and added a standard poultry seasoning and McCormicks roasted garlic powder. Mixed it with a fork until the seasoning began to break down. Placed the mixture into the injector and injected the breast in 6 different places. First a we rub a light coating of olive oil on and under the skin of the breast. We used the same poultry seasoning and McCormick’s roasted garlic powder for the outside of the breast. Season heavily, this is one large piece of meat. At this point we take the seasoned breast, cover the tinfoil prep pan and place it back into the refrigerator. Let it sit for a few hours to allow it to absorb the flavors we just added. We are going to grill our whole turkey breast “beer can style”. I purchased a cheap large tall beer to do this. 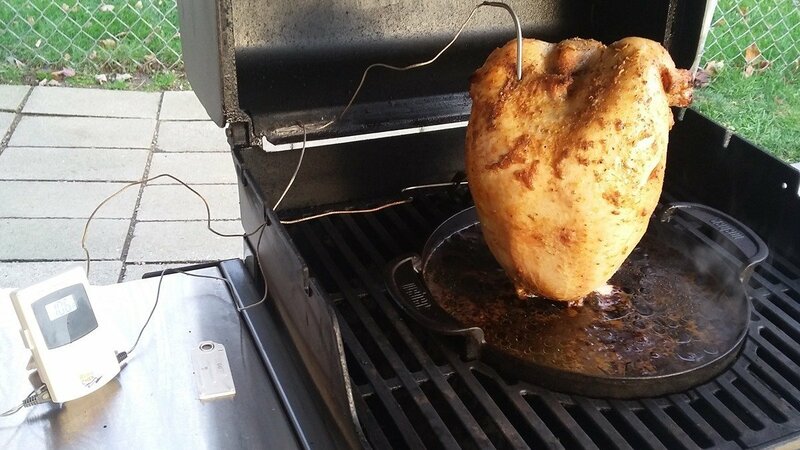 It turns out all that is needed is a regular beer can and a beer can chicken stand. Before attempting to grill a whole turkey breast. Make sure you have enough fuel. It is going to be a long cook. We set our gas grill up for medium heat indirect grilling with a drip-pan. Our grill has a drop in cast iron pan that we use for this. 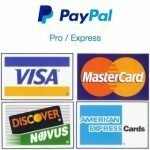 We are looking to maintain a 350 to 400 grill hood temperature. We will be using our trusty Maverick ET-73 thermometer to monitor both our grill and food temperatures. Using a thermometer like this isn’t necessary. It is just makes it a little more convenient. We place the turkey breast on our stand. Place it onto the grill and add some beer to the drip pan. 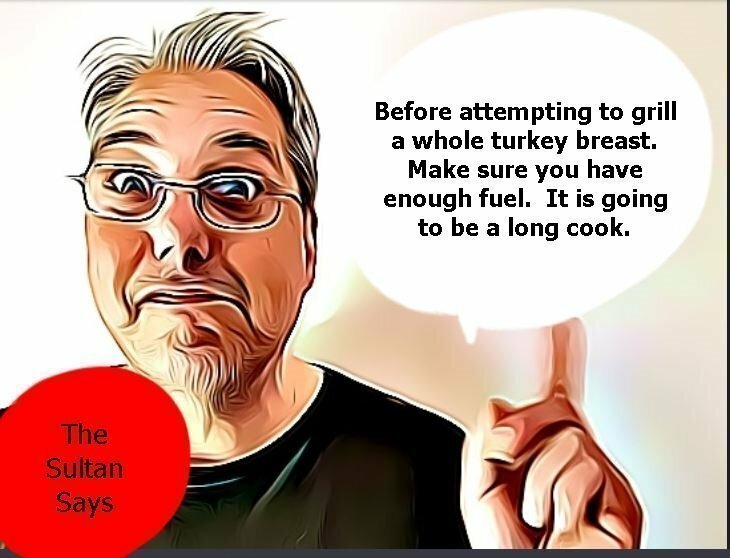 Then place the turkey onto the pan insert the food probe. Take some pic’s, close the lid and walk away. If you’re not using a remote thermometer check it every hour or so early on. After about an hour and a half. I noticed the grill temp rising. I went to check. The drip pan had dried out. I added just water to it this time. Our grill is small and the pan is large. This causes the liquid in the pan to boil away. A larger grill or smaller pan would prevent this from happening. At the 3 hour mark we go out and add a little more water to the pan. We want it to dry out for the last hour to crisp up that skin. Our Turkey breast temp is at 117 degrees and should begin to climb rapidly from here. At this point I am guessing we are about an hour away from being finished. This sets the wife in motion. Heating up rolls and warming the stuffing, mashed potatoes and green bean casserole. At hour 4 our temp is now at 160 degrees. We are almost there, about 10 minutes later we hit 165. When we open the grill the breast falls over. 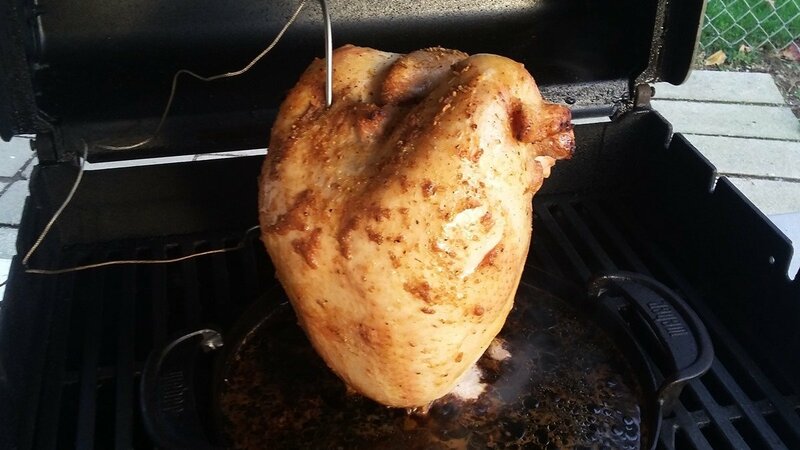 This is why you need to use a beer can chicken stand and not the large beer can we used. That photo-op was blown. 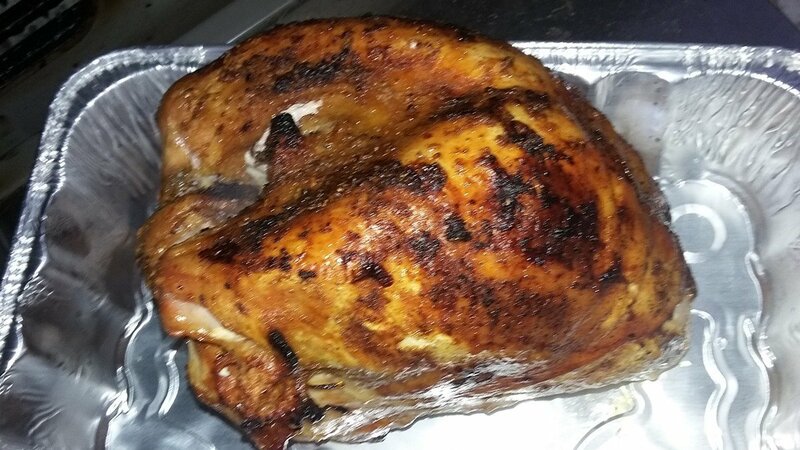 The end result was a terrific traditional tasting moist and juicy grilled turkey breast. 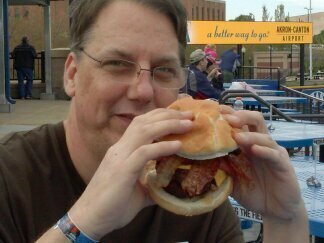 The skin could have been crisper but it was not rubbery at all. 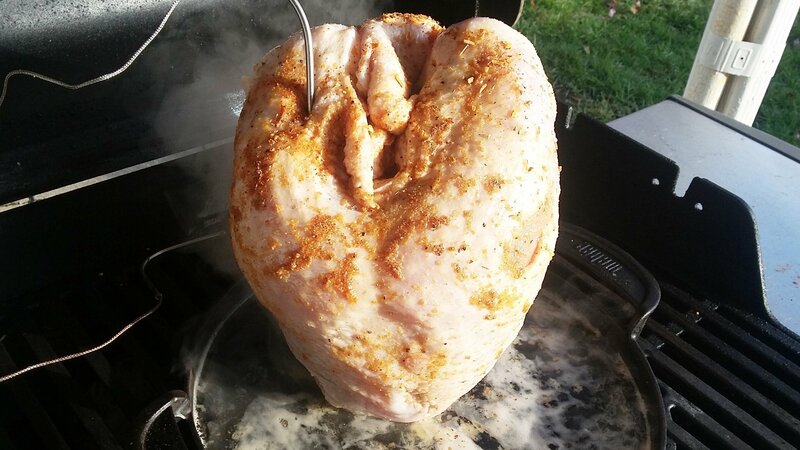 We grill our turkey breast beer can style, upright with a drip pan on a Weber gas grill. Grill for 4 hours over indirect medium heat removing the drip pan for the last hour, until internal temprature reaches 165 degrees.